The floor is a great place to introduce some colour and style. Because the entryway is a high-traffic area, you will want to invest in a durable rug that can stand up to all the comings and goings in your home. Pick one that goes well with your other design elements too! The last thing you want is an entryway with no area for keys, bags, and gloves. A dresser, console table, or chest would be great for this job. Don’t forget a small chair for when you are putting on shoes too! It won’t look right if your foyer’s table is a gigantic hulk if you do not have space and vice versa. There is nothing wrong with adding accessories and furniture to an entryway as long as they all are the in the right size to not skew the scale. Most people these days shy away from using wallpapers; but when done right, they can make a drab entryway look extra chic. With the multitude of wallpaper designs available these days, it is near impossible not to find one that will look perfect in your home. A single stark bulb overhead can create unflattering shadows. Go for a few light sources in the form of a sconce, a lamp, and soft overhead light to add a warm glow to your foyer. Decorating your foyer the way the rest of your home is decorated is a great way to introduce guests to your style. A few bamboo accents and some stones would be just right for a zen-inspired home. If you’re into country style, a basket and some fresh flowers should do the trick. Don’t be hesitant to add some local touches. If you live near the beach, a few seashells would be nice. If you live in the city, a miniature restaurant or store sign could work. You can also decorate your entryway to reflect both the indoors and outdoors for a smoother transition. An outdoor chair with a soft cloth throw over plush a plush pillow can be a nice touch. 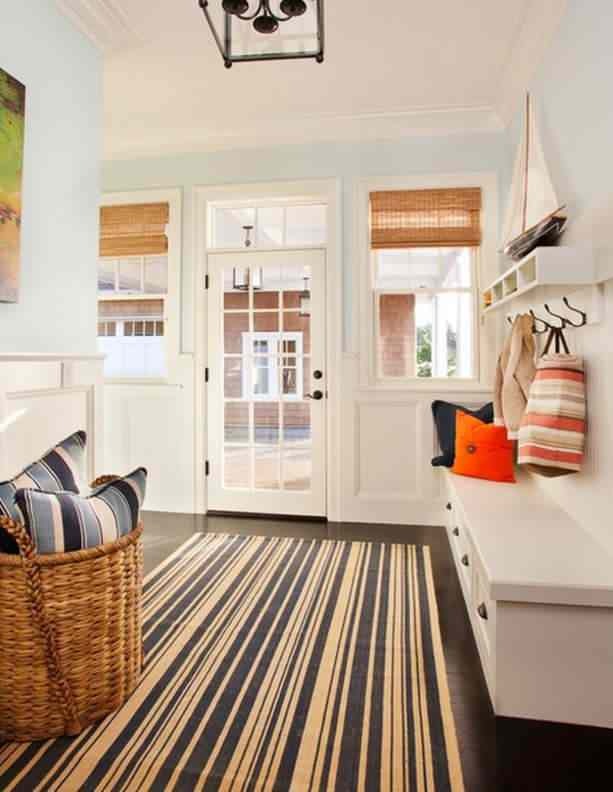 Careful use of primary colours can give your entryway some exciting energy. Use this in the rug, a bright piece of art, or perhaps a huge framed mirror can work wonders. Most entryways in apartments and urban homes are small, so making a big statement might be tricky. You can style your foyer in such a way that it makes a big statement about who you are and what your style is with just the use of accessories. A nearly non-existent foyer can come alive with a beautiful rug, an eye-catching wall accent, or with the clever use of paint and lighting. Looking for an Oakville luxury home that comes close to your ideal? Browse the available Oakville homes in our listings and find one that you like. Simply contact us to see the entryway and the rest of the house in person.